The new EOS Portfolio Tracker app, launched October 22nd at App Store, is making life easier for the cryptocurrency’s holders. 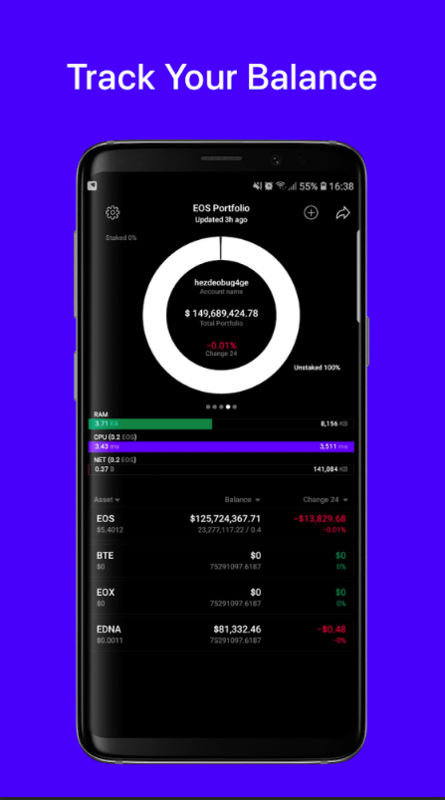 Available on iOS and Google Play, EOS Portfolio Tracker makes allows users to manage and track their cryptocurrency assets from the comfort of their smartphone. While there are a number of portfolio apps on the market that allow crypto investors to monitor their holdings, EOS Portfolio is by far the most feature-rich option focused entirely on EOS assets. Where users may have had to use 2 or 3 apps before, they can now consolidate these functions under one umbrella. According to the App Store description, EOS Portfolio’s wide array of functionality includes: multi-EOS account support, 24 hour change tracking, airdrop notifications, and the ability to use the app without entering a private key — a security feature that will especially appeal to a user community that suffered a wallet phishing scam earlier in 2018. Users can track the total value of their portfolio in dollars, Bitcoin, or Ethereum. The token database includes EOS, PUB, IQ, BLACK ,KARMA, CHL, CET, HORUS, WECASH, EDNA, ADD, EOSDAC, ATD, BOID, EETH, IPOS, DICE, EOX, DAB, SEVEN, EPRA, WIZZ, SHAPE, COA, TRYBE , LUCK, BT, WIZBOX, FAKE, POOR, ITECOIN, CAT, BET, MEETONE, ROY, EBT, FAID, ESB, LUCKY and many others. The app’s release follows increased worldwide interest in EOS over the past year, including 7 figure investments from billionaires Peter Thiel and Mike Novograts. The token is listed on all major exchanges and currently ranked number 5 on Coinranking.com, with a market capitalization of nearly 5 billion USD. EOS Portfolio Tracker is the latest effort from Kepler Technologies, the developers behind Lukrum portfolio tracker, and Kattana — a best-in-class professional cryptotrading terminal. To keep up to date with latest EOS Portfolio Tracker news, join the official Telegram group, Twitter or follow the blog on Medium.